The Combate Beach is situated in Cabo Rojo, Puerto Rico. It is one of the best and most well-known beaches on the west side of the island. Combate Beach is a great spot for water sport, eating, camping and other leisure and adventure activities. 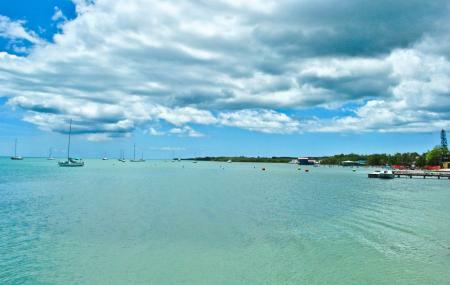 The beach is surrounded by a vast number of restaurants, bars and eateries to choose from, which makes it one of the most popular tourist destinations in Cabo Rojo. Once you make the drive down to the beach, you can choose to kick back and relax either in one of the beach side shacks or on the sand itself. The clear blue skies provide a great opportunity for sunbathing in the summer. The beach overlooks beautiful light blue waters, which make for quite a sight. You can even go swimming into the sea, or if you’re a bit more of an adrenaline junkie, go for the various water sports on the beach. The beach is also home to locals with small sailboats, which you can ride out into the sea. You can go for a walk in the adjoining village, which is filled with souvenir shops, painters and other artisans. Combate Beach is one of the most relaxing stretches of land in Cabo Rojo. The quaint village nearby, full of local delights, simply adds to its charm. Don’t forget to visit this beach during your time in Puerto Rico. How popular is Combate Beach? People normally club together Parguera Trailer Camp and Vaiven Tasca En El Mar while planning their visit to Combate Beach. The location is good. The beautiful area. It has a beach Has a pool. Recommendations: 1. Have a buffet breakfast. 2. System of locks of rooms is electronic. 3. Free ice service. 4. A la carte meals. 5. More staff at the front desk. 6. Coffee in the room. I know you probably want to see the pictures of the hotel but forget that, this is the backyard and it makes EVERYTHING much better. Their staff is amazing, they have a restaurant inhouse with delicious food good prices. Best vacations in PR. Small in size, it is only a short 1 1/2 min walk to the beach. I will definitely come back and enjoy another sunset. A bit pricey for off season. But the accommodations are great, room was very clean. Nice hot water, good a/c, comfy bed. Can't beat the west coast vibe.